Build a new society through anti-U.S. action! The People's Democratic Party held a rally and a demo in Seoul on Nov. 20, calling for the liquidation of evils, social drastic reform, conclusion of a peace pact between the DPRK and the U.S. and withdrawal of the U.S. forces from south Korea. They stressed the need to drive the GIs out of south Korea by efforts of popular masses and replace the Armistice Agreement with a peace pact and build a new society in which the Korean nation lives by its concerted efforts. 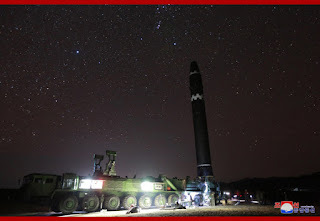 South Korea has purchased the U.S.-made weaponry and conducted war games owing to the U.S. pressure, it has offered upkeep expense for the GIs and the U.S. has lined its pocket by the expense of upkeep, they charged. Saying a danger of war is looming contrary to the will of candlelight resistance, they noted that they should wage a strong action for uprooting the evils and build a peaceful society by liquidating the conservative forces. The current government is conducting war exercises against north Korea, while supporting Trump who is escalating the danger of war in the Korean Peninsula by spouting a string of war, they denounced. 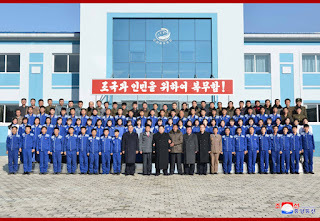 They called for launching a vigorous drive to build a new society in which the popular masses are masters of it and withdraw the U.S. forces after concluding peace accord between the DPRK and the U.S.
A touch-and-go situation is lingering on in the Korean Peninsula after end of unheard-of war games against north Korea with involvement of three U.S. nuclear carrier strike groups, Trump forced south Korea to pay funds spent during the war exercises to evade the political crisis and he squeezed 22 billion US$ extracted from the people's tax during his trip to Seoul, a statement issued in the rally charged. At the end of the rally, the participants marched as far as the building of the "government" with placards and handouts written "Eradication of evils!, No war! ", "Rejection of foreign interference!, National cooperation!" and "U.S., leave south Korea with THAAD! ", carrying pictures depicting anti-U.S. feelings and no war games targeted north Korea. Pyongyang, November 29 (KCNA) -- A test-fire of the inter-continental ballistic rocket Hwasong-15 was successfully conducted on November 29 under the guidance of Kim Jong Un, chairman of the Workers' Party of Korea, chairman of the State Affairs Commission of the DPRK and supreme commander of the Korean People's Army. Kim Jong Un personally supervised the whole course of the test-fire. 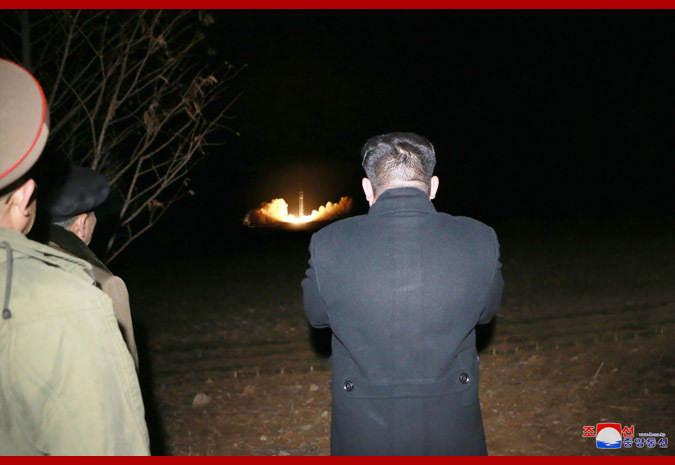 He indicated the orientation of developing a new type rocket that can make the final victory of the country in the showdown with the U.S. imperialists and gave detailed instructions every day to the Academy of Defence Science for doing so and thus made sure that the Hwasong-15 weapon system was successfully completed. Upon receiving the report that it is ready to test-fire the new type ICBM on Nov. 28, he came out to the place where technical preparations for the rocket was under way late at night to see the 9-axis self-propelled launching vehicle manufactured by workers of the munitions industry. He praised them for having successfully made the vehicle to be impeccable. He expressed great satisfaction over the fact that such vehicles can be manufactured as many as the country wants now that the munitions industry has made a breakthrough in putting the production of all parts of the vehicle on a domestic and Juche basis 100 percent. 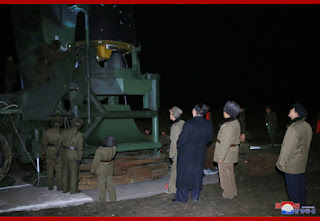 He went to the launching ground and meticulously guided the pre-launch processes one by one including the one for vertically standing the rocket. 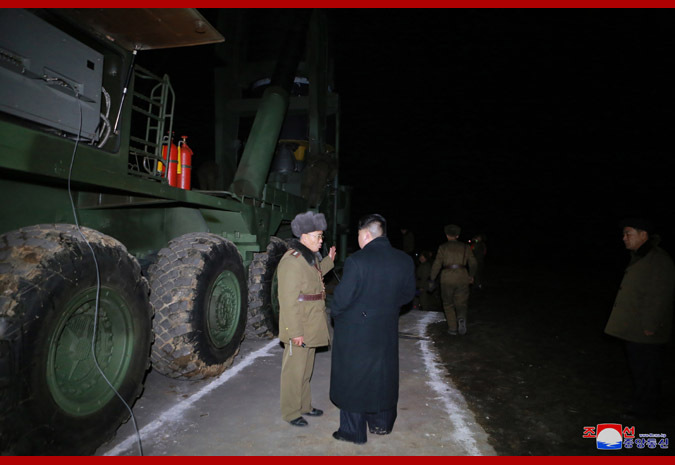 At an observation post for command he learned in detail about the launching plan and issued an order to launch the rocket. The rocket successfully blasted off and soared into the sky. 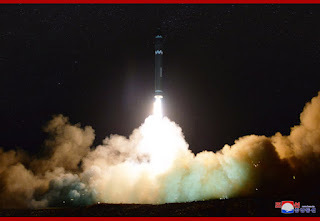 The ICBM Hwasong-15 soared to the highest altitude of 4 475 km and made a flight over the distance of 950 km for 53 minutes before making an accurate landing in the preset waters in the open sea in the East Sea of Korea. The test-fire confirmed that all the integers of the weapon system have satisfactorily complied with the requirements of design and that it is capable of fully ensuring reliability in combat situation to serve its mission as strategic weaponry system. Particularly, the accuracy of hitting targets by posture control and speed correction in the mid-flight section, accuracy in operation of high-thrust engine to which propulsion vector control is applied and the engine of high specific thrust was confirmed, and the accuracy of design integers of subsequent guided and stabilization systems was verified. 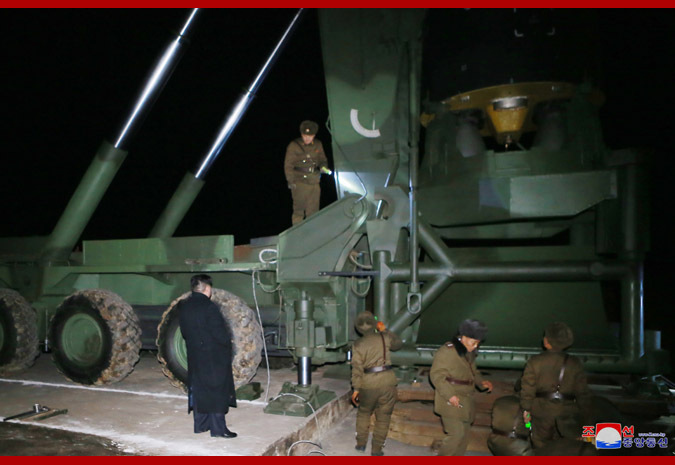 Also confirmed were mobile and hoisting capabilities and operational reliability of launching system of the nine-axis self-propelled launching vehicle newly developed and completed. 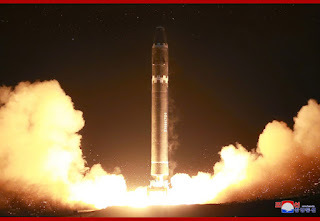 The test-fire also re-confirmed the control and stabilization technology, phase-separation and start-up technology and the safety of warhead in the atmospheric reentry environment that had already been confirmed. 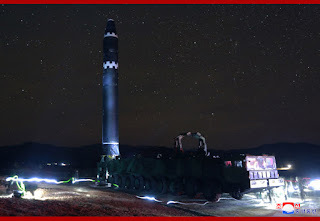 The ICBM Hwasong-15 weapon system represents the weapon system peculiar to the Workers' Party of Korea, which was developed with domestic efforts and technology 100 percent to suit the specific conditions of the country. With this system, the DPRK has become possessed of another new-type inter-continental ballistic rocket weaponry system capable of carrying super-heavy nuclear warhead and attacking the whole mainland of the U.S. 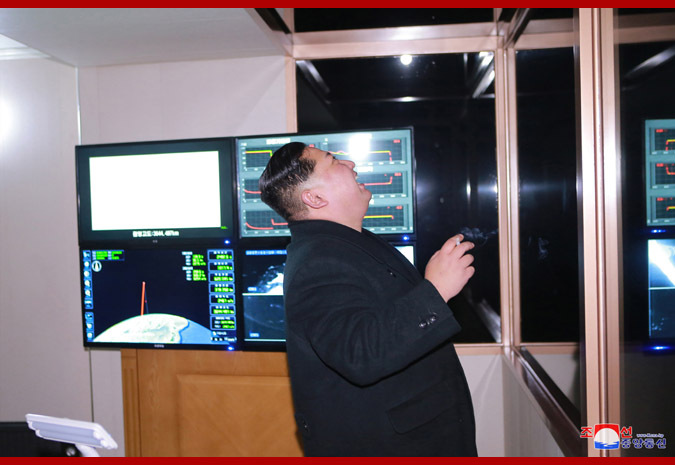 Greatly satisfied with the at-a-go success in the test-fire of the newly developed ICBM Hwasong-15, respected Supreme Leader Kim Jong Un was so excited to express his great satisfaction and extend his heartfelt gratitude to all those who took part in the development of the new type rocket weapon system. 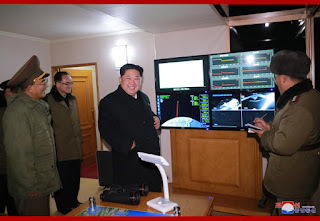 He said that the day was a significant day when the historic cause of completing the state nuclear force, the cause of building a rocket power was realized, adding that the day, on which the great might of putting the strategic position of the DPRK on a higher stage was given birth, should be specially recorded in the history of the country. The dazzling achievements made in all fields of the country recently including the field of national defence science are a great victory which can be won only by the heroic people of the DPRK who remain true to the cause of our Party without vacillation, weathering all tempests of history. 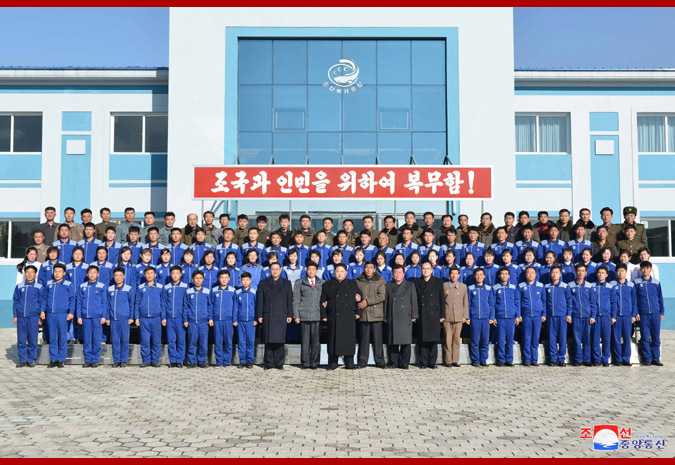 He warmly congratulated scientists, technicians, workers and officials in the field of the defence science who demonstrated once again the dignity and might of Juche Korea by succeeding in the test-fire of the newly-developed ICBM Hwasong-15, and had a photo taken with them. 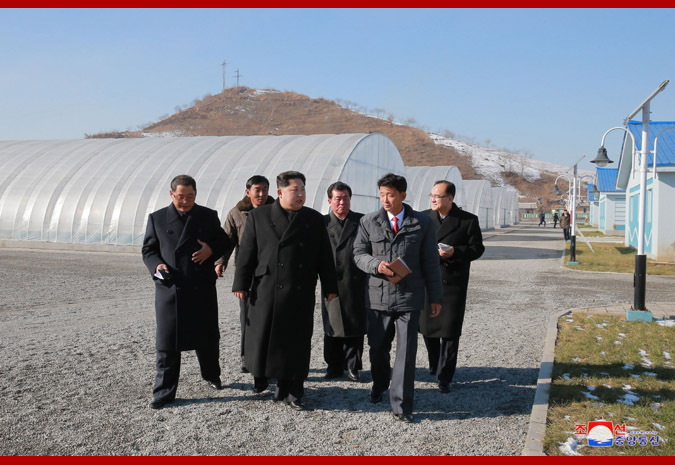 Pyongyang, November 29 (KCNA) -- Recently, the U.S. House of Representatives passed the "2018 bill on amendments to the National Defense Authorization Act", which increased the next year's defense budget to 700 billion US dollars. According to the U.S. act on budget control instituted in 2011, the annual defense budget should be limited to below 600 billion US dollars. However, the Trump administration already increased the defense budget by 54 billion US dollars in March this year and is about to increase it dramatically next year. What should never be overlooked is that the U.S. put up "nuclear and missile threats from north Korea" as a pretext for the sharp increase of its military spending. The U.S. Lower House increased the budget for the Missile Defense Agency under the Department of Defense to 12.3 billion US dollars under the excuse of "nuclear and missile threats" from the DPRK. 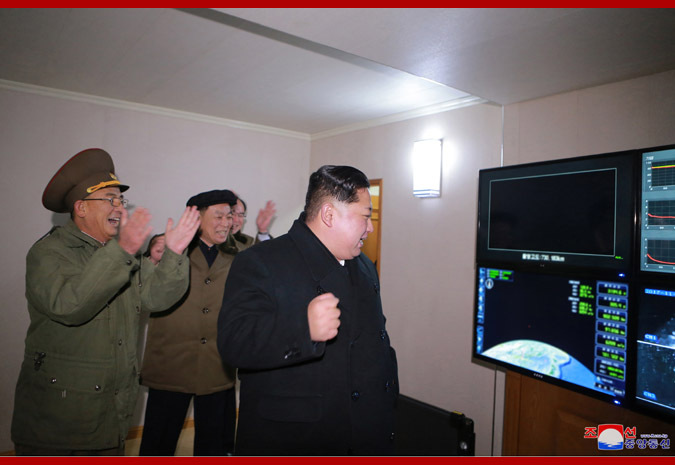 It decided to allot a fabulous amount of money for deploying the missile interception system targeting the DPRK and beefing up the U.S. forces in Asia-Pacific, as evidenced by its deployment of 28 GBI ground-based interceptor missiles in Alaska and nuclear-capable strategic bombers near the Korean peninsula. Such crazy act of the U.S. as spending astronomical funds for its military in peacetime, not in wartime, in a bid to dominate the world with absolute military edge is greatly concerning and stunning the public. 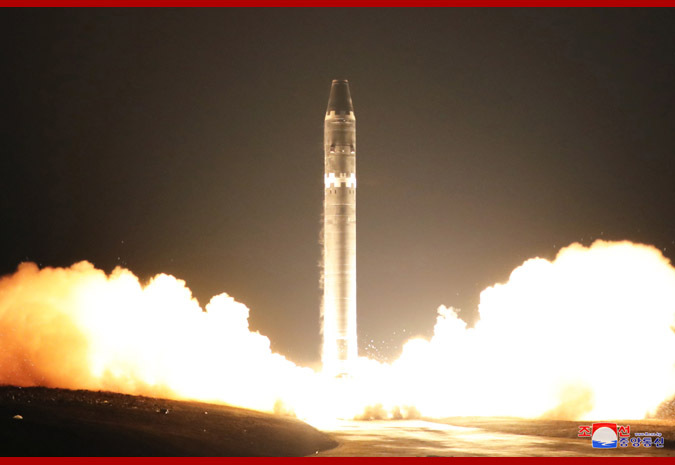 The U.S. has clearly revealed its true intention of hyping "nuclear and missile threats" from the DPRK through the above-said "bill". 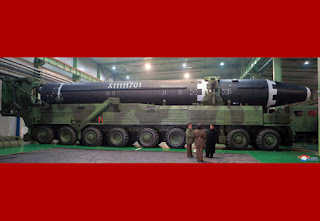 It is just a revelation of its brigandish design to dominate the world by force and occupy at any cost the countries failing to kowtow to it by military threats and aggression as it is aimed to invent a pretext for increasing military expenditure to invade the DPRK and realize the strategy for putting the whole world under control. This is clearly proven by the racket of military threats being escalated by the Trump administration, its development of new type nukes and modernization of war hardware. 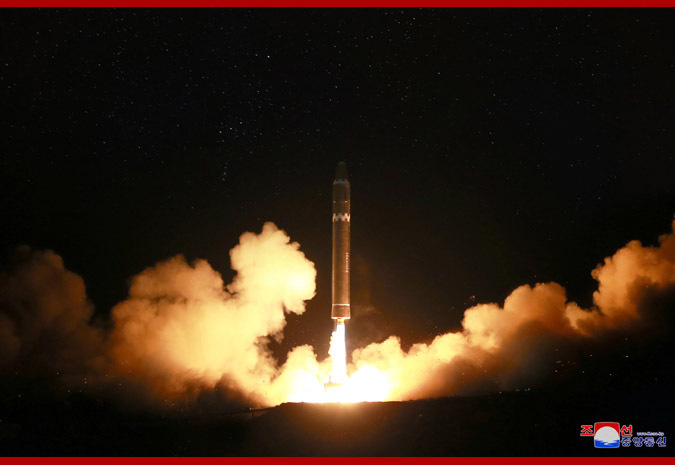 Asserting the security of the U.S. mainland can be ensured only when its missile defense system is deployed on earth orbits, the U.S. even talks about the resumption of the "star wars" project. 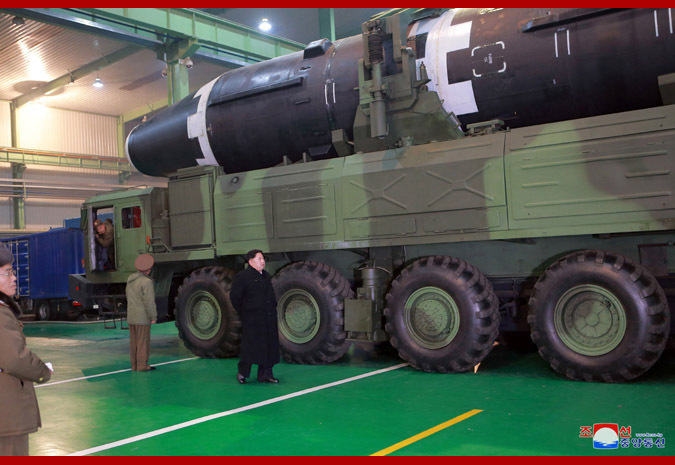 It even raised the "conception of comprehensive and immediate strike" and is crying out for testing its main components in Korea soon. 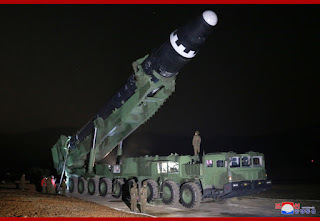 According to reports of foreign media, Trump recently asked the Congress to increase the military spending by 5.9 billion US dollars and is going to use 4 billion US dollars for the deployment of missile defense and reconnaissance systems on the Korean peninsula. The U.S, despite its almost empty national coffer and national debt amounting to 20 trillion US dollars, is resorting to such reckless increase of military expenditure. It is, indeed, a belligerent country of military gangsters and a cancer-like one against mankind. 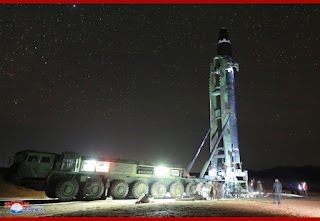 History proved that the increase of U.S. military spending resulted in adding fuel to the arms race among big powers, harassing global peace and security and increasing the danger of a nuclear war in the Korean peninsula and the region, in particular. 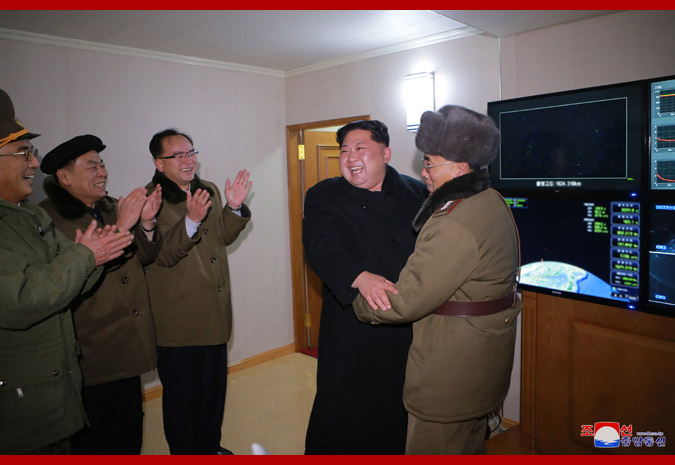 Pyongyang, November 29 (KCNA) -- It has been 72 years after the foundation of the Juche-oriented air force which has reliably safeguarded the territorial air of the DPRK in the spirit of devotedly defending the leader and the country. Kim Il Sung penetrated deep into the significance and importance of the air force and declared the birth of the Juche-oriented air force through the publication of the historic speech "Let Us Create the Air Force of the New Korea" he made on November 29, Juche 34 (1945). 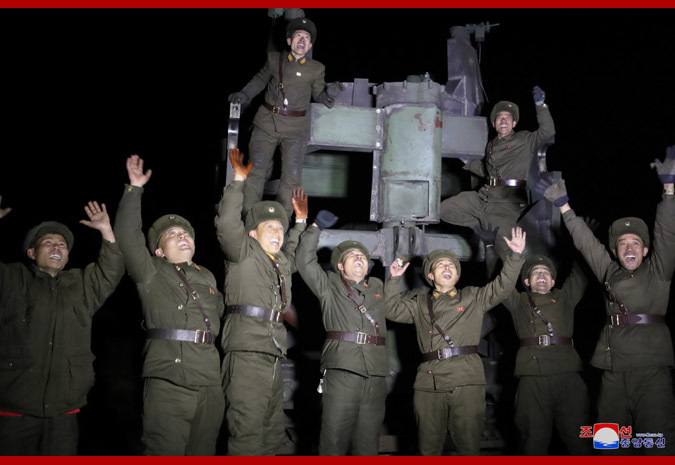 Since then, the air force of the DPRK has performed great feats in the grim annals of the Korean revolution. In the period of the Fatherland Liberation War (1950-1953), the U.S. imperialists hurled one fifth of its air force, boasting of its "air supremacy", but could not escape shameless defeat. Only in a week of July 1950, the DPRK air force shot down 13 U.S. warplanes, including "B-29" and damaged over 10 warplanes. At dawn of January 1, 1952, they destroyed more than 20 warplanes and lots of combat equipment through a surprise bombing attack on the Kimpho airfield. In June 1952, a plane of the DPRK air force shot down or dispersed more than 20 enemy warplanes in the sky over Sinuiju, thus defending the President on a tour of inspection. 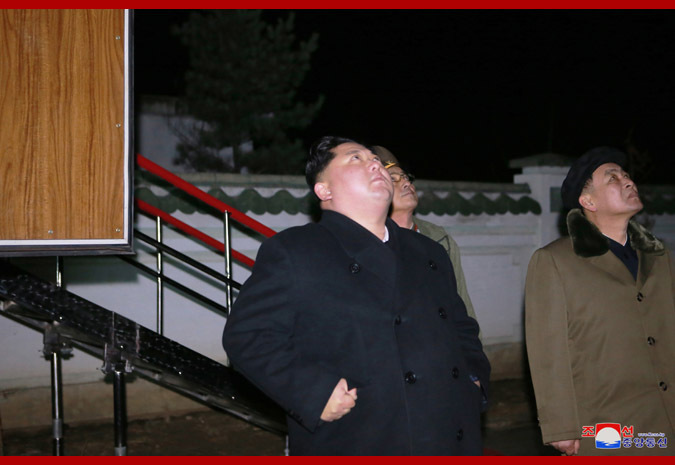 After the war, the DPRK air force has dealt telling blows to the U.S. imperialists whenever they invade the territorial sky of the DPRK. It is well evidenced by the incidents of "F-80" shot down in January 1954, "EC-121" downed in April 1969 and "RC-135" driven back in March 2003 and others. 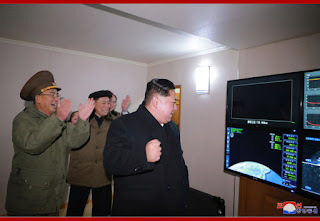 In the new century of Juche, the DPRK air force has enjoyed its heyday, demonstrating its invincible might under the guidance of respected Supreme Leader Kim Jong Un. In this period, it has produced 14 human bombs, possessed of a-match-for-a-hundred heroic spirit and self-sacrificing and self-blasting spirit, and a number of service personnel decorated for their meritorious service. And dozens of air units and subunits were named after the heroes, including Kim Hwa Ryong, Kang Sung Hyon and Ri Ki Bong, who dedicated their life to defending the leader and performed great feats during the Fatherland Liberation War. The title of Hero of the Republic was awarded to fighter 009 for playing a great role in different battles during the war and fighter 415 for shooting down "EC-121" and to other warplanes. 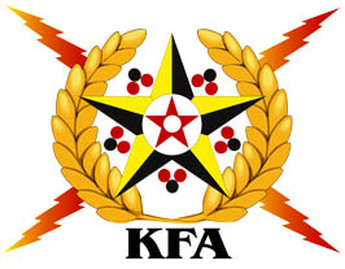 UK KFA strongly condemns Boris Johnson for his anti-DPRK remarks and his interference in the internal affairs of the DPRK by giving them a lecture on twitter about missile tests . 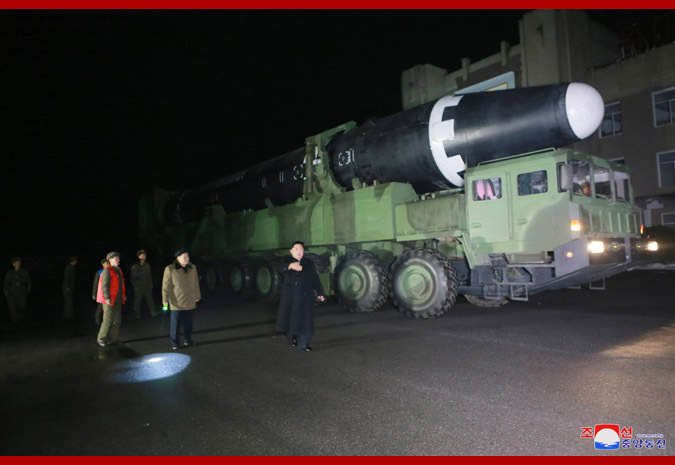 Firstly , the recent missile test is the independent and sovereign right of the DPRK . It was carried out on the soil of the DPRK and was not a threat to anyone so there is no need for Mr Johnson to comment on it or get involved in the matter. Secondly, the DPRK's missile and nuke programme are a response to the continuous decades long nuclear threat of the US against the DPRK . Mr Johnson needs to be reminded that it was the US that first introduced nuclear weapons onto the Korean peninsula some 60 years ago in contravention of the Korean Armistice Agreement . Is Johnson saying that the DPRK does not have the right to defend itself. 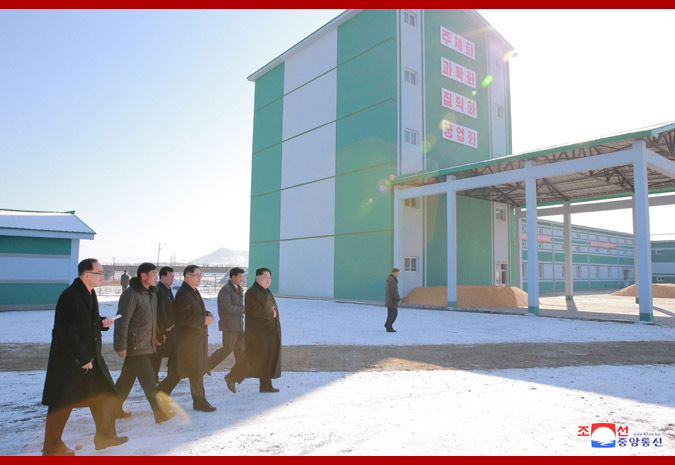 Thirdly, the line of building the nuclear force and economy in parallel is the way to prosperity and this is evidenced by new housing construction in Pyongyang and increasing living standards. So basically Boris Johnson needs to shut up and mind his own business ! HANDS OFF THE DPRK ! 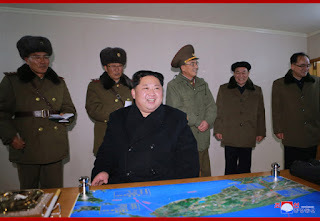 The US imperialist warmongers plan exercises with 230 fighter planes which will make sorties to the sky above south Korea from eight bases in Japan and south Korea in order to hold a war drill simulating an actual war. It is said that six F-22s and three to four F-35As will be involved in the air drill codenamed Vigilant Ace. It is the first time that six F-22s which are called strategic weapons by the U.S. imperialists are introduced into south Korea. The said drills will also reportedly involve about 12 000 troops from navy and marine corps. 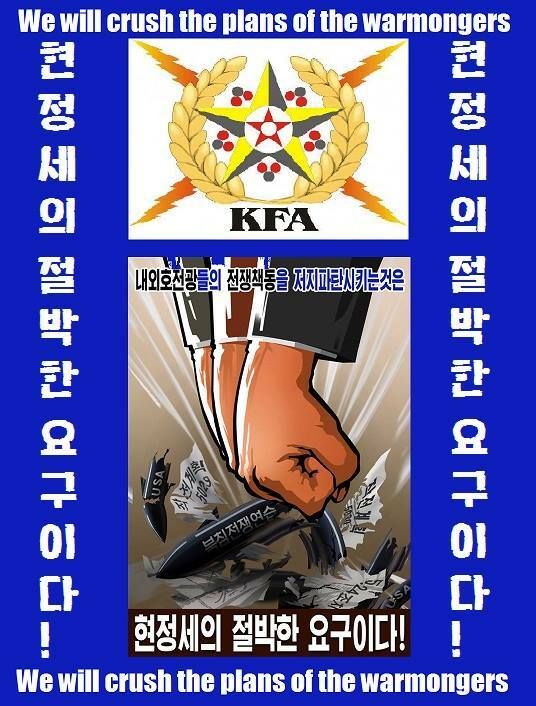 We condemn the US imperialists and south Korean fascist puppets for creating tension and threatening People's Korea ! The planned exercises should be cancelled and US imperialist forces withdrawn from the south of Korea ! US OUT OF KOREA ! 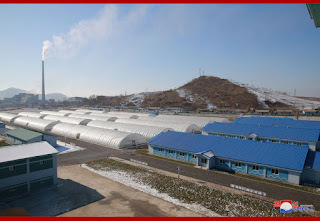 The statement of Jo Chol Su, director of Press of the Institution for American Studies of the DPRK Foreign Ministry is a totally justified response to the scaremongering rumours started by some policy research institutions and media of the U.S. and other Western countries that the DPRK plans a nuclear attack on south Korea during the Winter Olympics . Such claims are baseless and serve only to inflame an atmosphere of war hysteria and paranoia as well an irrational phobia against People's Korea. 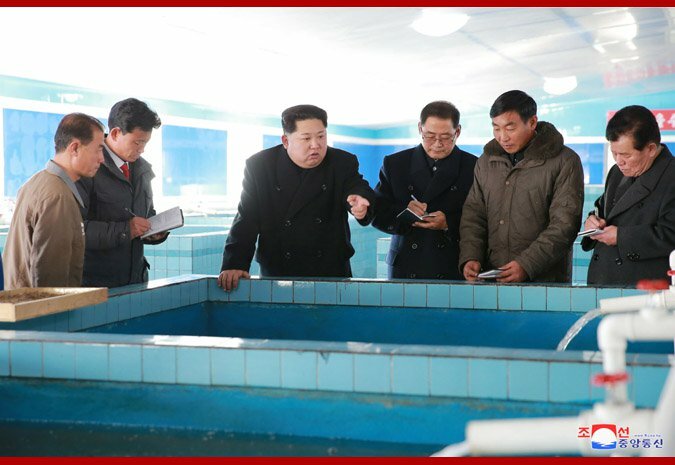 The director of Press of the Institution for American Studies of the DPRK Foreign Ministry is totally correct to describe these allegations as slander and demonisation. Indeed such allegations are deeply irresponsible as they contribute to tension and war psychosis . The DPRK's nuclear deterrent is what it says it is a deterrent . 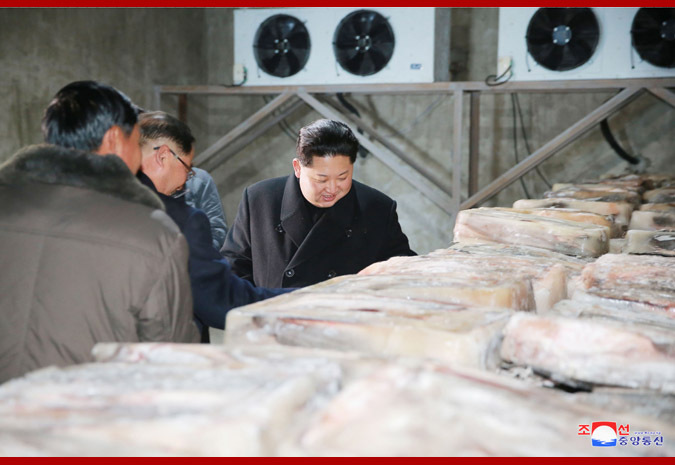 It is to protect the DPRK's independence and sovereignty and actively contributes to world peace . 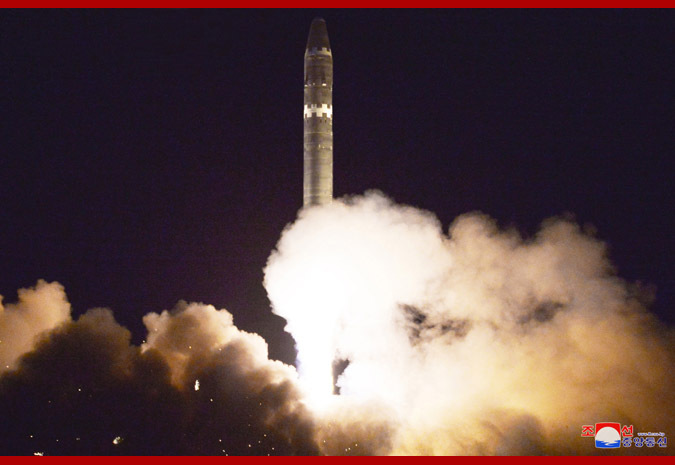 It is the US that is raving about pre-emptive attacks and it the US is the only country that has used nuclear weapons. The DPRK's nuclear deterrent is only aimed at the US , its sworn enemy . 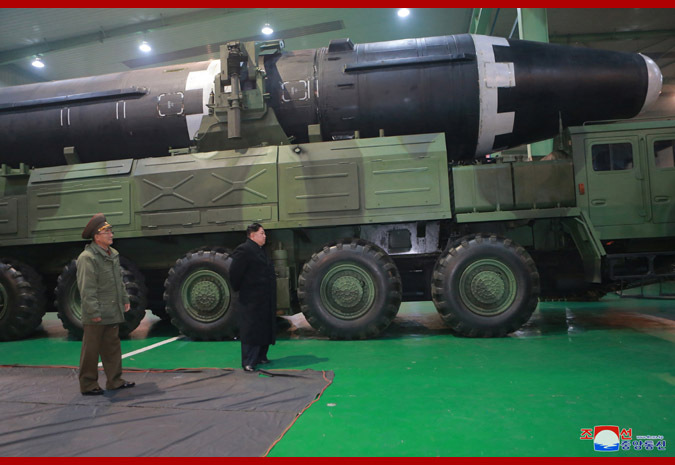 The DPRK's nuclear deterrent only came about because of US imperialism's continuous nuclear threat to People's Korea and its hostile policy. 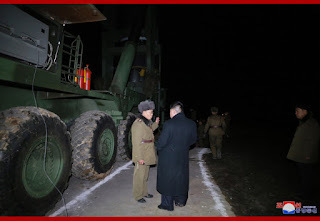 The pseudo-academic elites of imperialism should stop writing nonsense about the DPRK and instead properly understand the reasons why the DPRK developed nukes ! 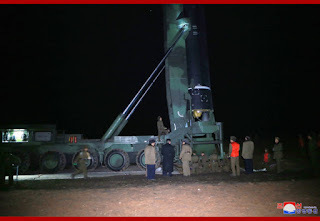 Early on the morning of the 29th of November the DPRK test fired the Hwasong- 15 ICBM from the suburbs of Pyongyang on the order of the dear respected leader Marshal KIM JONG UN , Chairman of the Workers' Party of Korea and Supreme Commander of the Korean People's Army. 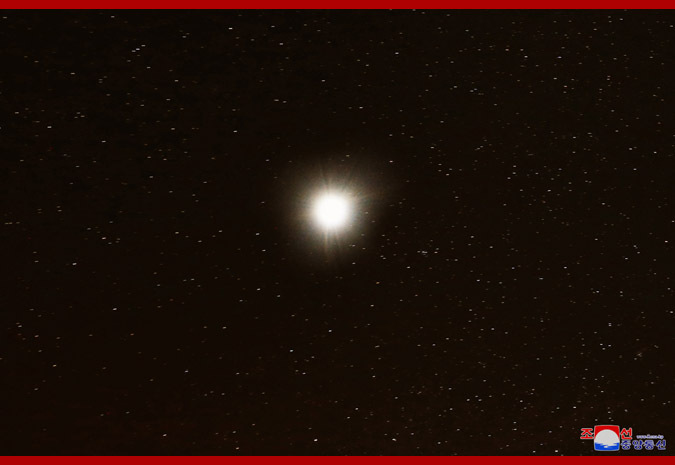 The rocket soared to the highest altitude of 4 475 km and then flew for 53 minutes covering a a distance of 950 km. The Hwasong-15 represents a great qualitative advance in the rocketry of Juche Korea . 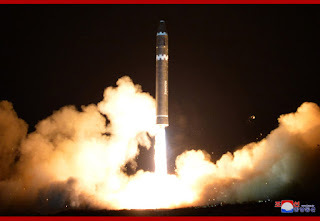 It is more advanced than the Hwasong -14 ICBM that was tested in July this year (2017) as it has a super-large heavy warhead which is capable of striking the whole mainland of the U.S ! This is a truly astounding and incredible achievement . 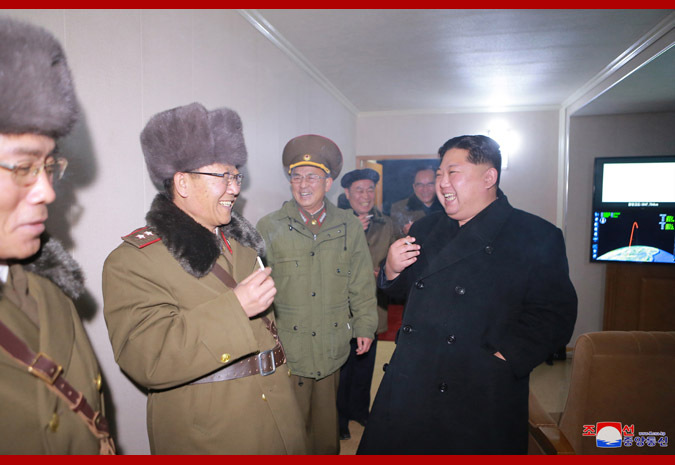 The DPRK is now free from the nuclear blackmail of US imperialism . 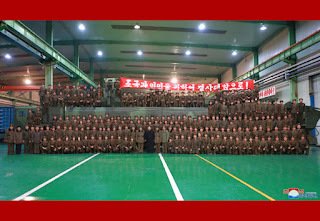 In the past the Korean nation could not make even very simple weapons and as a result fell victim to Japanese imperialism but now Juche Korea is emerging a independent nuclear power and a rocket power which is capable of countering any threats to its existence and independence which come from US imperialism .We Juche Idea ,Songun idea followers ,true friends and advocates of People's Korea in the UK rejoice over this . It is another great victory for the Juche Idea and Songun idea , it also shows the correctness and validity of the line of developing the nuclear force and economy in parallel as well of the great self-development first idea . 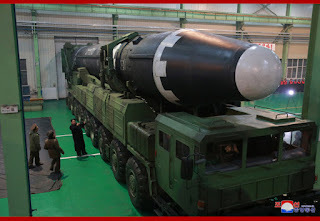 By the testing the Hwasong-15 ICBM Juche Korea has militantly defied US imperialism , world imperialism and big-power chauvinism . 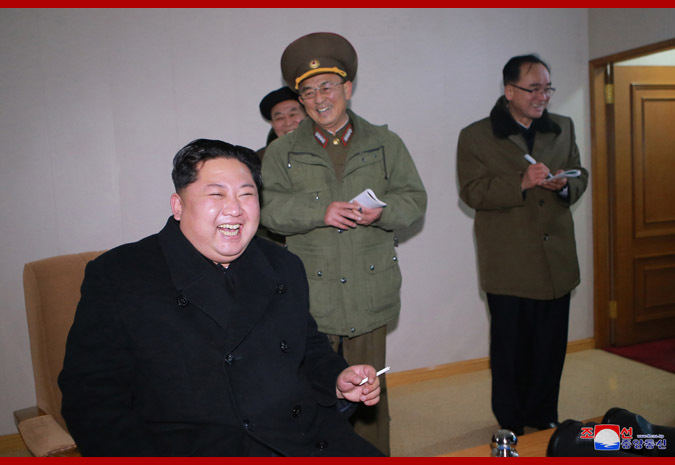 Juche Korea has shown that it is not intimidated by the insane threats of warmonger , fascist Trump .Juche Korea has not bent under the weight of imperialist sanctions but holds high its head ! 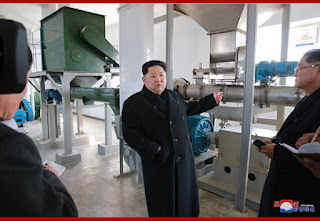 The DPRK under the Juche-orientated and Songun-based leadership of dear respected Marshal KIM JONG UN has stuck to the revolutionary path of Juche and Songun . 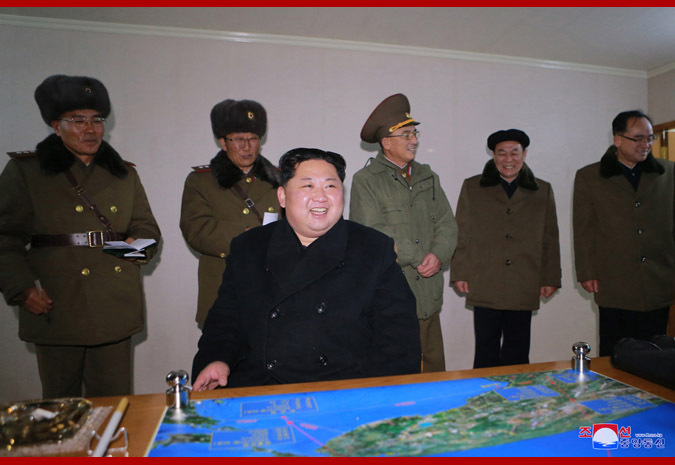 Juche Korea did not follow the example of a certain country which capitulated to US imperialism within a mere few days . 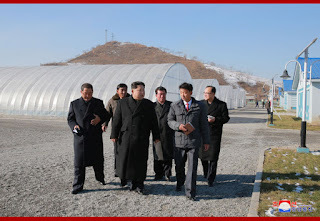 Juche Korea is not Libya or Iraq nor the old revisionist Soviet Union ! No one should take issue with the test fire of the Hwasong -15 ICBM .This is the independent right of the DPRK . Moreover the DPRK Government in its statement declared that the Hwasong -15 ICBM would " ensure the peaceful life of the people, and therefore, they would not pose any threat to any country and region as long as the interests of the DPRK are not infringed upon"
We sincerely congratulate dear respected Marshal KIM JONG UN , the DPRK government and Workers' Party of Korea and the Korean people on another great victory . 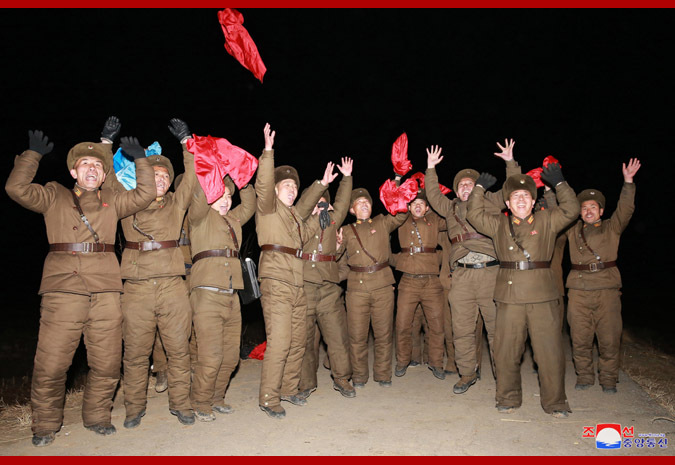 Victory and glory always belong to the Korean people ! 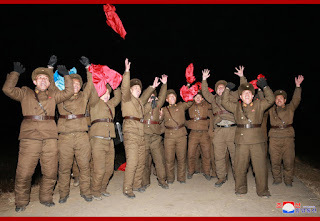 LONG LIVE PEOPLE'S KOREA ! The test-fire of intercontinental ballistic rocket Hwasong-15, newly developed under the political resolution and strategic decision of the Workers' Party of Korea, was successfully carried out. 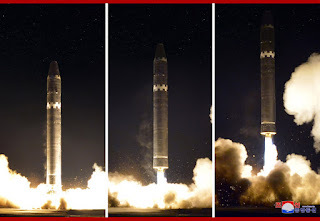 The ICBM Hwasong-15 type weaponry system is an intercontinental ballistic rocket tipped with super-large heavy warhead which is capable of striking the whole mainland of the U.S. 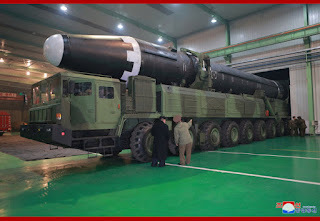 This system has much greater advantages in its tactical and technological specifications and technical characteristics than Hwasong-14 whose test-fire was conducted in July last, and it is the most powerful ICBM which meets the goal of the completion of the rocket weaponry system development set by the DPRK. 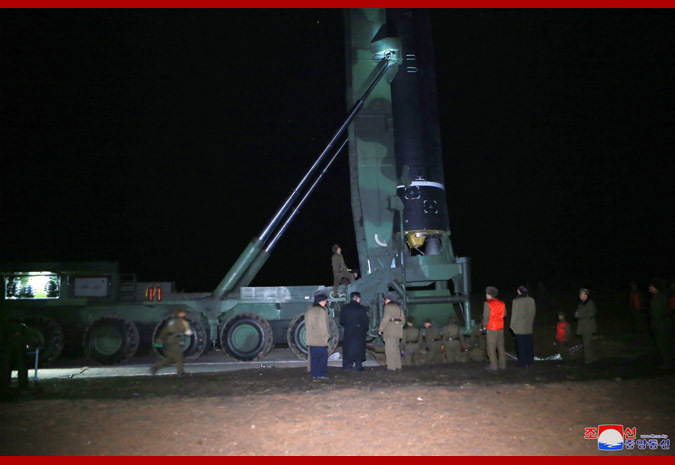 Upon authorization of the WPK and the government of the DPRK, ICBM Hwasong-15 was launched at 02:48 on Nov. 29, Juche 106 (2017) in the suburbs of Pyongyang under the guidance of Comrade Kim Jong Un. 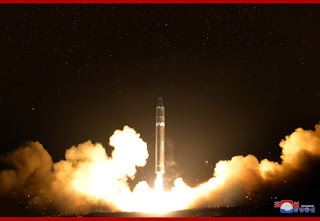 After making a 53-minute flight along its preset orbit, the rocket accurately landed in the target waters set in the open sea in the East Sea of Korea. 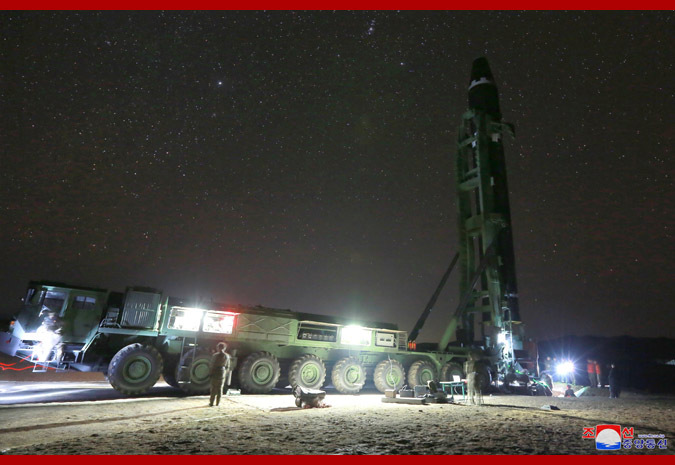 The test-fire was conducted in the highest angle launch system and it had no adverse effect on the security of neighboring countries. 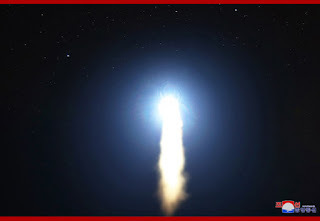 The rocket soared to the highest altitude of 4 475 km and then flew the distance of 950 km. 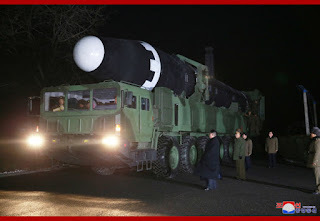 After watching the successful launch of the new type ICBM Hwasong-15, Kim Jong Un declared with pride that now we have finally realized the great historic cause of completing the state nuclear force, the cause of building a rocket power. 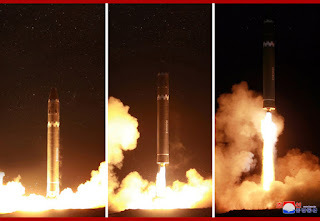 The great success in the test-fire of ICBM Hwasong-15 is a priceless victory won by the great and heroic people of the DPRK who have upheld the WPK's line on the simultaneous development of the two fronts with loyalty without the slightest vacillation despite the vicious challenges by the U.S. imperialists and their followers and manifold difficulties. 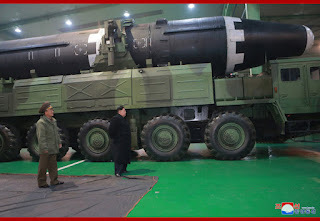 The development and advancement of the strategic weapon of the DPRK are to defend the sovereignty and territorial integrity of the country from the U.S. imperialists' nuclear blackmail policy and nuclear threat, and to ensure the peaceful life of the people, and therefore, they would not pose any threat to any country and region as long as the interests of the DPRK are not infringed upon. This is our solemn declaration. Recently, some policy research institutions and media of the U.S. and other Western countries publicized the so called "merciless nuclear attack plan" of the DPRK and claimed that the DPRK is planning random and indiscriminate attacks on the U.S. and Asian countries drawing no distinction between military and civilian targets. 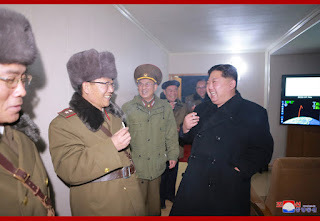 On the other hand, they are prompting the baseless speculation that the DPRK seeks a nuclear attack on south Korea during the Pyongchang Winter Olympic Games and that the DPRK might go for another "ultra high level provocation" by conducting a ballistic missile test launch on the occasion of Christmas. 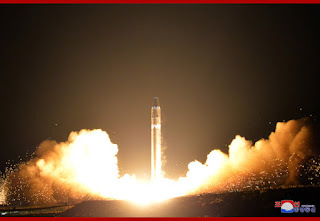 They claim that these projections are based on their study and analysis of the reports by the DPRK's media, however these are nothing but slanders to "demonize" the DPRK by twisting the meaning of our tough stand and absurd paradox worked out by the laymen who lack elementary understanding of the purpose of the DPRK's nuclear deterrence. 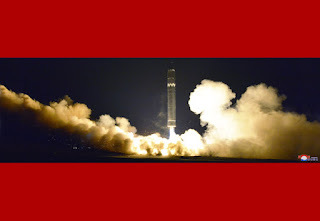 It is none other than the U.S. that is hatching plots to launch preemptive nuclear strike on sovereign countries after adding them to the list of targets for its nuclear preemptive strike, and the American politicians are the very ones who call for the military option and preemptive strikes against sovereign states time and again without the slightest hesitation. 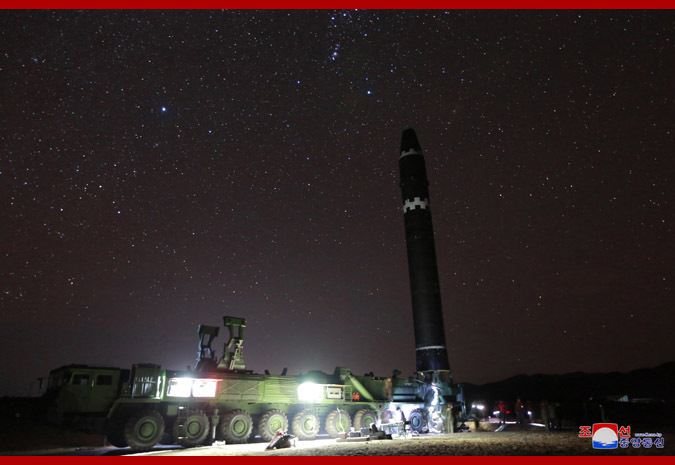 The U.S. deployed massive amount of its nuclear assets into the Korean peninsula and ceaselessly carries out joint military exercises under various names. 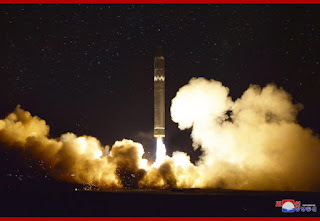 Current situation evidently shows that it is only a matter of time that a nuclear war breaks out on the peninsula due to Trump's war mania and that the choice made by the DPRK was absolutely right. 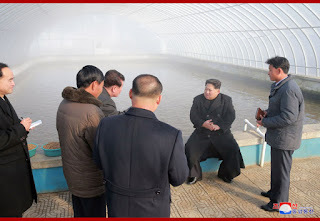 The attempts to defame the dignified image of the DPRK by spreading baseless allegations against it are further increasing our vigilance as they are happening at the time when Trump designated the DPRK as a "state sponsor of terrorism" after vowing to "totally destroy" it and the moves of the Trump administration to stifle the DPRK are reaching the extremes. To make it clear once again, the DPRK's nuclear force which targets none other than the U.S. is the reliable deterrent to prevent a nuclear war and firmly defend peace on the Korean peninsula by thoroughly eradicating the half-a-century long unilateral nuclear blackmail and threat from the U.S.
We take this opportunity to issue a warning to the pseudo-intellectuals who are hurling vicious abuse at the DPRK in pursuance of the moves of the Trump administration and some of the Western media that are producing false reports based on absurd and groundless speculations. 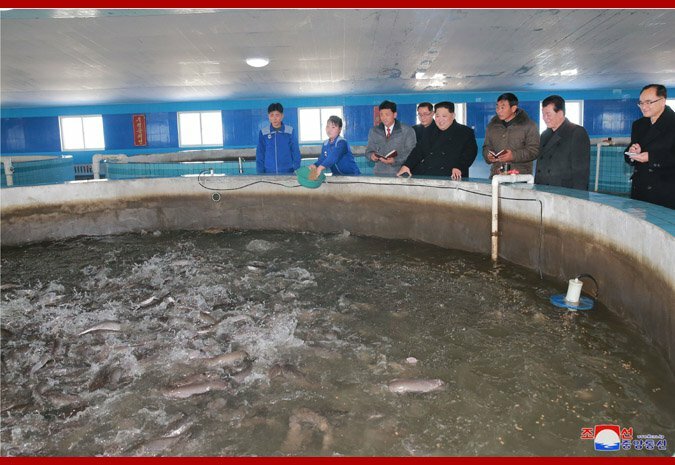 Pyongyang, November 28 (KCNA) -- Respected Supreme Leader Kim Jong Un gave field guidance to the newly built Sunchon Catfish Farm. 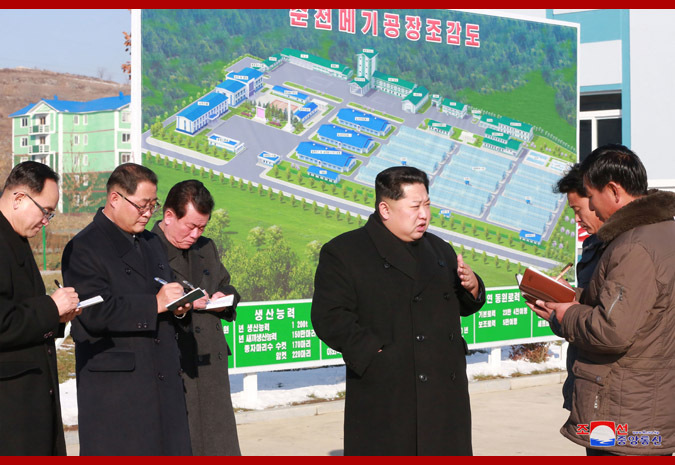 He looked round the mosaic depicting the benevolent image of leader Kim Jong Il erected in the compound of the farm and then was briefed on the farm before a map showing the bird's eye view of it. 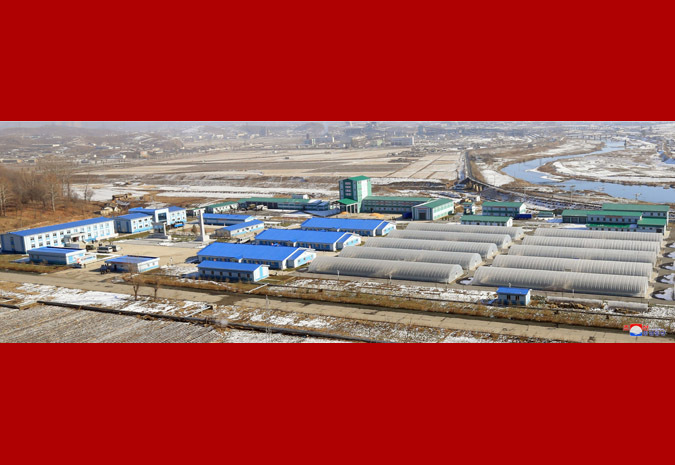 The farm, with a total floor space of more than 24 120 square meters, consists of districts for production, auxiliary production, welfare and others and its production capacity is 1 200 tons per year. 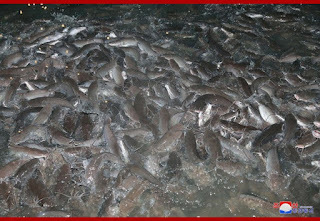 In December 2015 the Supreme Leader took a step to build a catfish farm of large capacity in Sunchon area of South Phyongan Province before other provinces, and guided how to design it and personally solved all the problems arising in its construction. 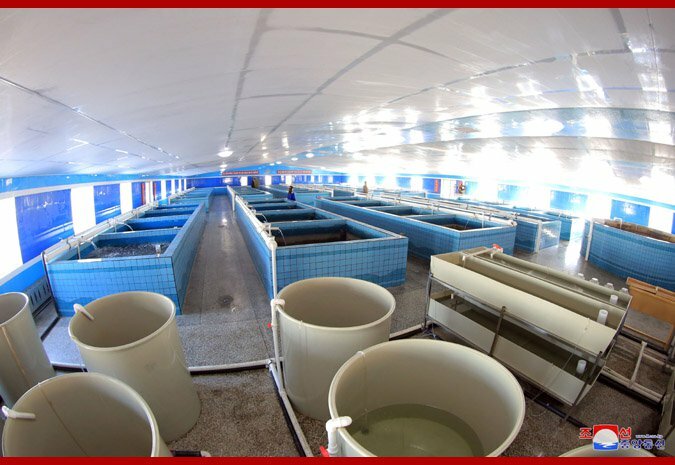 The officials, builders and volunteers of the province inaugurated the farm and started its production in October last by conducting a dynamic campaign from the outset of its construction. 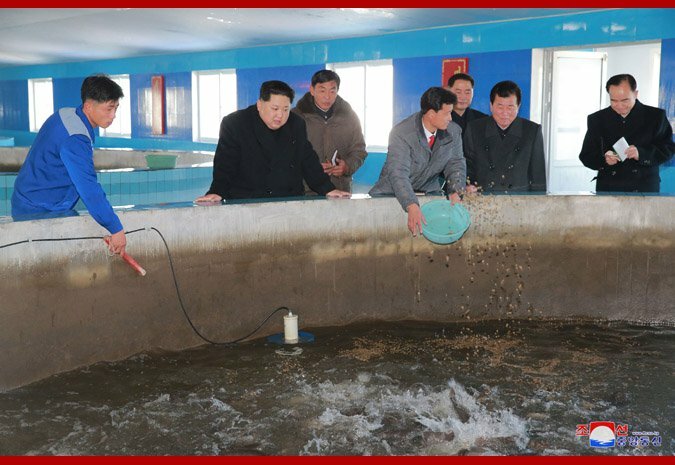 Noting that the farm, well built in a tidy and neat way, is in an excellent location to always ensure warm water vital to the growth conditions of catfish by using the waste water from the Sunchon Thermal Power Plant, the Supreme Leader said that South Phyongan Province took the lead in implementing the Party's policy of building modern catfish farm put on a Juche, scientific, intensive and industrial basis. 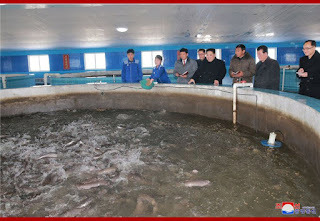 He went round room dedicated to the history of the farm, sci-tech learning space, combined production control room, hatchery, indoor fattening ground, plastic-walled pools, feed processing plant, material storage, freezing storage and other parts of the farm to learn in detail about its construction and production. He gave instructions on the management and operation of the farm, stressing the need for it to set an ambitious goal and put the production on a normal track. 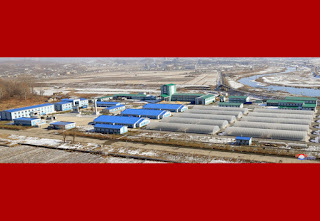 The farm, which came to being amid the struggle to implement the decision of the Seventh Congress of the Workers' Party of Korea, is a precious creation of the officials, party members and other working people of South Phyongan Province who turned out with optimism about the future and reliance on their own efforts, he said. He added that his confidence grows stronger upon hearing that the people of the province came to keenly feel again, through the construction of the farm, that they can do anything and can be better off when they give play to the revolutionary spirit of self-reliance. He highly appreciated the feats performed by the officials, builders and volunteers for building the perfect farm as intended by the Party, saying he was very satisfied with the farm completed to be impeccable even in the distant future. 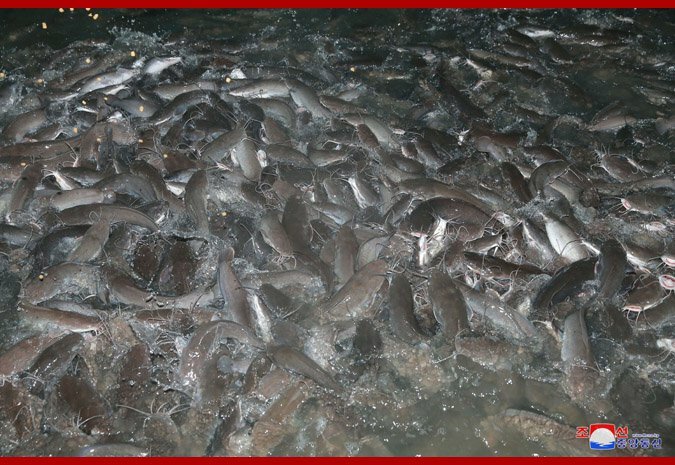 He expressed expectation and belief that the officials and employees of the farm would surely turn out 1 200 tons of catfish every year for the people of the province under the banner of scientific fish farming, and had a photo session with them. 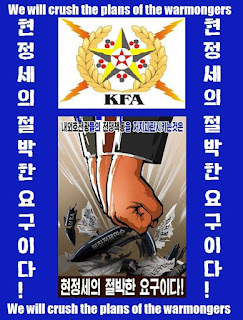 UK KFA Statement on Google Censorship !
" US-empire of Terrorism "
A Fierce Struggle against Trump and U.S.